Cowley College students had an opportunity to present their original works during the Lines & Lyrics event held Friday afternoon at the Calder Bonfy Amphitheatre. The next Lines & Lyrics event will take place Friday, April 21 at 12:15 p.m. 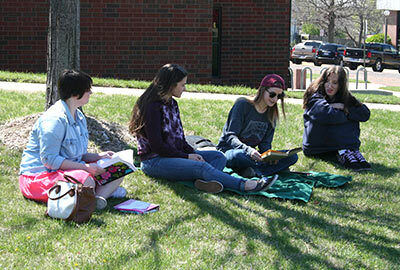 The next Writers’ Corner will take place Thursday, April 27 at 7 p.m. in the Earle N. Wright Community Room. A reception for graduates in the program will follow the event. Those pictured are, from left, Allie Lawrence, Jocelyn Young, Kaitlyn Cathey, and Brandy Batemon.